My time at Dominican University has provided me with the tools to engage and grow into a profession that fulfills my desire to do work that is; socially responsible, committed to education, emerging technologies, and that embraces dynamic change. My career in retail provided me with many ways to provide excellent customer service, and the opportunity to collaborate in running a large corporate store, with an extensive inventory. I began my graduate education as a business professional ready to continue engagement with diverse communities and to be an active colleague in a library. It’s my job to find a culture and group of people where I can best succeed. The most effective librarians I have met are kind and responsive people. I am embracing a profession that is in love with learning, and the librarians that embody service and education are the people I want to emulate. I view this as an exciting time to be in the profession. Change in libraries is slower than in business, as corroborated by the many articles I have read about the pace of changes in library technology and management. I considered the complexity of information creation and management on a recent tour of Encyclopedia Britannica (the first edition was published in 1768). Their business model and information delivery system has completely changed, and they admittedly were slow to respond to that. They continue their core value of producing trustworthy content and have diversified into high-quality educational curriculum products. They are still learning how to be a 21st-century digital encyclopedia and curriculum creator, redefining their niche while keeping their reputation intact. They are taking time to assess content considerations, engaging and building digital audiences, and developing taxonomies and data analysis to maximize their search engine optimization. These are valuable examples of environmental assessment, staff collaborations that stay mission focused, and the use of strategic planning to increase the scope of their mission which was traditionally reference based. They have created new revenue channels by expanding into digital education, and in the process rebranded themselves with young users, who have the potential to be life-long customers. These experiences of seeing inside information organizations have been some of the most beneficial in providing insight into different organization models, and what they are doing to cope with change. Because most of my work in school was produced in isolation, I used the access the program gave me to participate in a variety of organizational experiences. Through three internships, one practicum, and multiple conferences, webinars, and a few interviews, I learned the importance of these critical practices and values. 1) That accuracy, consistency, and meta-tagging in the production of metadata are critical to the management of digital objects. 2) That I have something to learn from every experience, and that failures will eventually lead to success. 3) That diversity is a value that I must advocate for, and it starts with reaching out and listening to other’s experiences and dreams. 4) That cynicism does not have a place in a profession built on knowledge creation and intellectual freedom. 5) To keep working on my professional passions, even if my current job is only a step along the way. 6) Be generous in service and support of peers. Conferences have been significant opportunities to explore new topics, develop critical thinking skills, see how professionals develop and present creative solutions to institutional challenges, and build new networks of professional friends. People in the profession are inherently generous in answering or finding the answers to questions, that is perhaps the greatest trait that drew me into the profession, as well as my curiosity and need for answers. Librarianship offers me meaningful social involvement, and the opportunity to collaborate in the transition from analog to largely digital information centers. From my first class, I saw that my business background increased my attention on a mission, planning, budgets, and problem-solving. My approach is to understand the mission and background of organizations. Without an understanding of organizational history, it’s hard to know how to impact the mission and understand the strengths and weaknesses of available resources. It has been difficult to not be part of a workgroup during this time in school, and I have been tested in my determination, motivation, and ability to create successful independent work. It has been a time of transition and determining how to use the best of my old profession with the values and purpose of my new profession. ENCORE LIBRARIAN CAREER GUIDE, BORN DIGITAL COLLECTION, and the DIGITAL COLLECTION WITH METADATA. Website design, resource gathering, planning, policy documentation, and storytelling. I taught myself how to use these platforms and used my BA in photography and design to layout and illustrate my materials. I branded myself the Encore Librarian and used that to create an online persona, my first attempt at defining myself as a librarian. STRATEGIC PLAN ANALYSIS I enjoyed synthesizing and analyzing this very large strategic plan. It was a great organizational choice for me to learn how outreach, relationships, and assessment gave a community a voice in the direction of their library. I see that no matter where a librarian works, you are public facing and should be building a diverse range of allies and collaborators. MCC SPECIFICATION PAPER This class gave me a foundation in computer systems and the complex role and power they have in organizations. It is important to understand technical challenges, and the collaborative nature of systems work. This was also my first try at project management, which I enjoyed because I had to create reasonable timelines and provide benchmarks for project completion. Determining work timelines is also critical when considering the scope and funding needs for new projects. MCC SOFTWARE WEBSITE PAGES This is the user interface for the MCC project, the illustration of data flow from the user side. It’s important to have clear project goals, and this work had a real-world goal, and that has been the point of many of the projects that I chose in school. I enjoy looking at organizations and figuring out how to improve and increase their service capability. ENCORE CAREER MARKETING PLAN I went to great length to make this look like an authentic document from this library, and provide the justification for the program, demonstrating the needs of the community. THE HULL HOUSE COLLECTION GRANT PROPOSAL, HULL HOUSE GRANT SLIDE SHOW I did this work in my last semester, drawing on all my classwork and conference experiences. 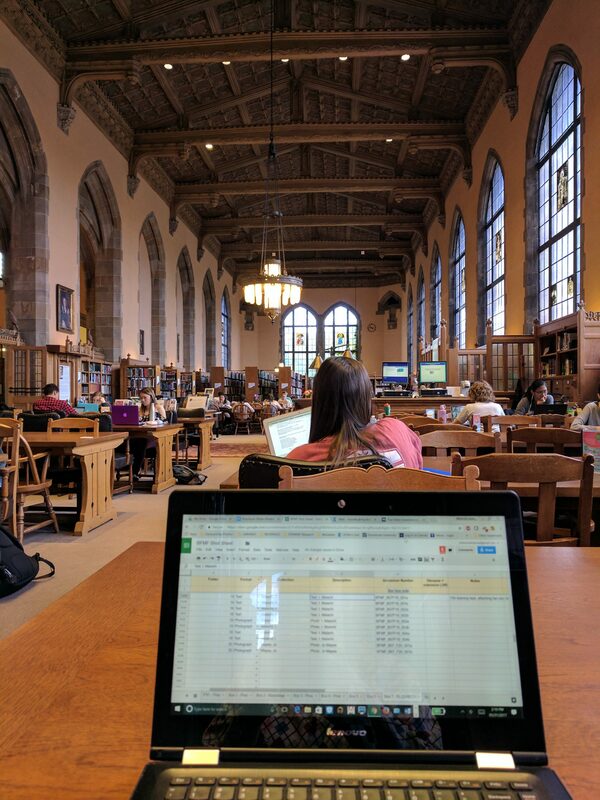 I researched and found a project that is ripe for funding, has critical preservation needs, is one of UIC’s most used collections, and would require the library to further integrate their online resource systems for better user experience. I most enjoyed assignments where I had identified needs in real institutions through evaluation. This project was hard to do because I did not have the benefits of true collaboration, and relationships. I called special collection librarians, called vendors for pricing, and found more details from people who work at the UIC library. These interactions continued to reinforce the professionalism and willingness to help and provide information and resources. I think determining the scope of projects is critical, because it affects everything from funding, to staffing, and every other project that the library staff already have on their plates. The most significant strength that I learned about myself in school, is my mental perseverance and persistence to embrace new technology, and succeed in classwork. I would not give up in the face of new learning, and my family could not understand how I had the energy to stay up most of the night, on occasion and drag myself up the next day. This determination is going with me to my new profession, and I believe it will serve me well in life-long learning. Sometimes school was frustrating because there was never enough time to master skills and concepts, but my conference attendance often confirmed that I am aware of most of the current trends and challenges of the profession. The next step is to be part of a team working with trends and challenges and building work skills into my theoretical knowledge. I believe that my work demonstrates attention to detail, creativity, research skills, awareness of issues in the field, a desire to write and communicate concisely and honestly, resource advocacy, dedication to excellence, critical thinking and questioning, patience, a desire for collaboration, the responsibility to educate and facilitate relationships, and the focus to follow through on projects. Group work in classes was difficult in school because we were not working for a common employer, were not a curated staff, and had very different work skills, interests, ethics, and schedules. Group projects were difficult without an organizational structure and expectations, leaving natural leaders to push ahead, instead of having more collaboration and personal responsibility from some individuals of a group. The professional identity and philosophy that I have most taken to heart are those of education service designed for diverse communities and the responsibility to reach across organizations to facilitate knowledge creation and innovation. Staying in step with organizational mission and keeping the pulse on strategic planning will assist me in blending my knowledge of community needs, emerging technology, staff ability and training needs, funding, and project planning. This level of awareness requires outreach and creation of new relationships that uncover the needs and dreams of all stakeholders. Collaboration with others helps to share the load when learning new technology and enables feedback that teaches and helps projects to progress. 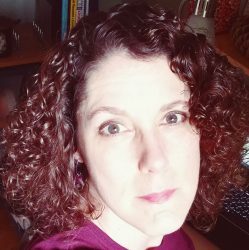 I am not as idealistic as when I started the program, but that is not surprising when you constantly hear about funding issues and librarians having to wear more and more hats. I learned that there is not one job in library position, but many and that the identity of librarians has become much broader and can be reinvented further through learning and innovative action. I wish for work with variety, and I think I will need to manage my time well and seek mentors to increase my development. Being stretched is something that is common in most fields, and each of us must learn how to balance our career and outside demands. Librarians exist not only to advocate for their materials and services but also to expand the reach, scope, and impact of their resources enabling their communities to be creators. Being an information professional is acting throughout a community, and not in isolation. It is a responsibility to be public facing, and viewed as a go-to resource, not afraid to ask questions, to challenge the status quo, and find answers or reach out for expertise from the community. A professional is invested in environmental scanning, assessment of ongoing and emerging technology, and how these services and resources impact their users and partner institutions. As in my first career, there is a need to prioritize, re-prioritize, ask questions, and be unafraid of new learning. An educator is always learning and looking proactively to form intuitive solutions for stakeholders. Being proactive is, openly sharing ideas and concerns, researching others work, attending and presenting at conferences, and documenting projects and best practices to create the highest impact on community activity. My identity will be as a community facilitator, protecting diversity and intellectual freedom, working to help others create and incorporate new knowledge into their lives. Preservation is my last main core-identity. Without records and data, we have little to offer that will allow users to build onto human knowledge, let alone come to a place of wisdom. Preservation involves seeking out diverse points of view as a living practice, this will directly impact records creation and interpretation of community history. An archivist should look for community members and seek their input when interpreting records of cultures that they are not native to. Through the study of the history of the profession, I have learned to reflect on my role when making decisions that affect access, intellectual freedom, copyright, diversity, and my social responsibility to the community. I recognize that the best position is to not reinvent the wheel but to move slowly, get feedback, and consult with many. Advocacy and professionalism have given me examples of ethical professional behavior, the need to gain allies, and the importance of embedding the profession into communities through service, listening, and cultural sensitivity. Internships have reinforced the nature of independent work, collaboration, trusting one’s work, and realizing that others feel just as uneasy at times when new learning is especially challenging. The Berkeley Folk Music Festival Collection at NUL presented a collaborative daily assessment, changes, and ongoing questions about best practice for the collection and holding to the terms of the grant. The generosity that has been given to me, is what I want to present in my professional identity. Kindness, patience, and instruction geared toward audience are critical soft skills that I have seen demonstrated in positive and negative ways. Where do I see myself in five and ten years? Processing special collections, having earned a DAS (Digital Archives Certificate). Managing analog to digital projects, staff, grant writing, and collaborating with faculty on facilitating the embedding of library materials and experiences into curriculums. Developing subject expertise and facilitating programs bringing diverse communities together for interactive cultural learning in library community spaces. My idea is to lead the libraries as community centers with transparent walls, and continue converting them into knowledge creation labs, and meeting centers. I would like to end up in larger institutions, archives, special libraries, or corporate centers that provide services and products that support sustainability and equity. My best work would allow me to also contribute my photography and visual design background for exhibitions, marketing, events, and websites. Part of the struggle in leaving school is feeling interested in so many aspects of the profession and knowing that my work trajectory and specialization will play a major factor in how my dreams will turn out.